Water Bed Size Super-Single Size Bed Dimensions are 48 inches wide x 84 inches long. These are standard Water bed Super Single bed measurements. Water bed Super Single Mattress depths can vary. In general, a wood sided water bed mattress is about 9 inches thick. Wood sided water beds were very popular in the last 30 years with the baby boomers. Since then, many boomers have aged and prefer innerspring conventional mattresses. Some of these boomers have substantial investments in their water bed wood frame and matching furniture. They can delete their water mattress and replace it with a King Size water bed innerspring replacement mattress. The mattress size measurement dimensions of a Super Single Size water bed innerspring replacement mattress is approximately 46 inches wide by 82 inches long. The mattress is a few inches smaller than the wood water bed frame to allow easier bedding installation. The same bedding can be used for both a water filled water mattress and a replacement innerspring mattress. The depth or height of this Super Single Size water bed innerspring replacement mattress is approximately 8 to 10 inches. Wood sided water beds were very popular in the last 30 years with the baby boomers. Since then, many boomers have aged and prefer innerspring conventional mattresses. Some of these boomers have substantial investments in their water bed wood frame and matching furniture. They can delete their water mattress and replace it with a King Size water bed innerspring replacement mattress. The mattress size measurement dimensions of a Queen Size water bed innerspring replacement mattress is approximately 58 inches wide by 82 inches long. The mattress is a few inches smaller than the wood water bed frame to allow easier bedding installation. 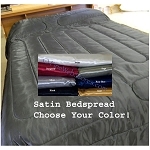 The same bedding can be used for both a water filled water mattress and a replacement innerspring mattress. 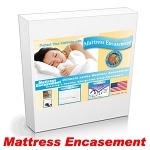 The depth or height of this Queen Size water bed innerspring replacement mattress is approximately 8 to 10 inches. Whether you prefer the crisp feel of cotton percale, the luxury of satin or the coziness of flannel, there is a waterbed sheet set just for you. The quality, price and selection of waterbed sheets has never been better. Shipping online for waterbed sheets is convenient and lets you choose from many quality retailers from across the country. Waterbed sheets are needed for anyone who has a hard sided waterbed. The typical hard sided waterbed consists of a wood frame, a pedestal, decking, vinyl safety liner, heating system and water mattress. Hard sided water beds are sized differently than a standard bed, hence the need for bedding and linens that are designed especially for them. A standard set of waterbed sheets includes a top sheet, bottom sheet and two pillow covers. Sheets for hard sided waterbeds have changed over the years. For many years, the top sheet and the bottom sheet were a one piece affair. The top sheet was sewn to the foot of the bottom sheet across the width of the sheet. The reason for this design was really quite simple. Waterbed sheets are held in place by deep pockets at each of the corners. Sewing the top and bottom sheets together kept the top sheet in place. For many people this was an inconvenient arrangement, since the sheets were bulky and would often twist together in the wash.
Over the past several years, there was a major change in waterbed sheet design. Rather than the old one piece sheet set, the top and bottom sheets are now separate. The bottom sheet has four deep pockets that wrap around and under the mattress. The top sheet has two deep pockets at the foot end holding the top sheet in place. Differences in quality and fabrics can not only affect your comfort and the durability of the sheets. A poorly sewn sheet set is no bargain. If the ends of the sheet material have not been properly finished the sheets may fray. To save money, some cheap waterbed sheets are made with slightly less fabric and this will adversely affect the fit. Sheets that fit too tightly will not stay in place and that can literally come apart at the seams. Remember that sleeping comfort can definitely influence the quality of the sleep you get. As it applies to sheet fabric, thread count is defined as the number of threads per square inch of material. The higher the thread count the heavier the fabric. The most inexpensive bed sheets will have a thread count of only 100. The feeling will be sheer and almost flimsy to the touch. A good place to start when shopping for waterbed sheets is a thread count of at least 200. Thread counts can range as high as twelve hundred for very pricey sheets. Even though there is a difference in the price of sheets with a higher thread count, the extra money will be well spent. Satin is very smooth, glossy fabric weave that is made from silk. Silk is the product of the hard working little silkworm. The silkworm is, in fact, a species of caterpillar. The silk is derived from the cocoon the silkworm weaves as part of its normal development into a silk moth. Before the silkworm is allowed to emerge, the cocoon is heated, often by placing it boiling water. The silk of the cocoon is then gently pulled apart and the material is spun into silk thread. Silk satin is a very tight and closely woven fabric. There are different grades of silk satin that can affect the quality of the fabric. It is important to know that all real satin is made from real. Some satin products, though labeled as such, may actually contain blends of silk and synthetic fabrics like polyester or nylon. Do not be confused by the terms satin with sateen. Sateen is a closely woven fabric that is usually made of cotton or a blend of cotton and a synthetic fiber like polyester. With a soft feel and glossy finish, sateen may have a look and feel very similar to that of silk satin but the two fabrics are not the same. By far the most popular and durable fabric used for waterbed sheets is cotton. Cotton is long lasting, comfortable and relatively inexpensive. Easily dyed and printed, cotton waterbed sheets can be found in a rainbow of different colors and print styles. Understanding how cotton fibers and fabrics are developed can help you chose the right sheets. Cotton sheets can be found in various weaves and finishes and not all cotton is created equal. Geographical differences in cotton cultivation can affect the quality and feel of the fabric. The southern United States has long been a center for cotton production. Domestically grown cotton can be found in various degrees of softness. Cotton from the American South is characterized by a short fiber length. The over length of the harvested fibers can affect its workability. A premium variety of cotton known as pima and supima has its roots in the American Southwest. Supima and pima fibers are very similar in texture to Egyptian cotton and cotton from other parts of the Middle East. Egyptian cotton is considered the gold standard for cotton fabric. Cotton fibers from the Middle East, and especially Egypt, are longer and softer. Once available only in fine linen stores, Egyptian cotton is more widely available. Flannel is made from cotton, producing sheets that very soft. There are different grades of flannel and heavier fabric will last longer. Some flannel is a blend of cotton and a synthetic fabric like polyester. Imagine sleeping in your favorite flannel shirt or flannel pajamas and you get an idea of why flannel is a popular choice for waterbed sheets. A common misperception about percale is that is a blend of cotton and polyester or other synthetic fiber. The term percale refers to a tightly woven fabric with a minimum thread count of two hundred. Percale can be pure cotton or a cotton blend. Percale sheets are crisp to the feel and very durable. The way in which percale thread is treated reduces pilling and helps the sheets hold their shape.